It’s here! The big day! Halloween! It comes but once a year! Now, some of you are out trick-or-treating, some of you are out partyin’, and some of you are watching the appropriately “spooky” movies. Heck, you adventurous-types will quite conceivably get around to all three before the day is out. But movies? And while we’re at it, Halloween-themed TV in general? That gets your pal me in the holiday spirit! And man, I have found a tape that exudes that Halloween spirit so overpoweringly, they may as well have created the holiday just so it could exist. And the thing is, it’s not even specifically tailored to Halloween. No, this one just hits all of the horrific hallmarks, and it hits them perfectly. I now present quite possibly the be-all, end-all release of the perennial Halloween movie, 1968’s Night of the Living Dead. Yes, the film has been released on home video countless times since pretty much the dawn of, well, home video. But this, this version, this is the zenith, the peak, the ultimate. Put out by Amvest Video in 1988, it took 10 years of video releases to do the movie right, and despite all the restorations and remasterin’ and whatnot the film has endured since, I dare say they’ve all fallen short of attaining the sheer magnificence that Amvest managed. This was lightning in a bottle, baby. Or something like that. NO IT’S NOT AND HOW DARE YOU SUGGEST OTHERWISE. Okay, fine, sure, it looks fairly ordinary – on the surface. Upon first glance, you may very well be tempted to immediately write this one off as just another cheapie video release of the immortal fright flick. Heck, had I not known better, I may very well have done the same thing. You don’t get the whole picture from the cover art alone, is what I’m saying. Not that I’m not saying the cover art is bad, mind you; indeed, you can’t go wrong using the fantastic original poster for your VHS sleeve. Granted, Amvest wasn’t the first nor last video company to use this original artwork, or at least a portion of it, but considering the sheer number of other, amateurish lookin’ releases out around the same time, this one does look decidedly more competent than many. The original poster art was black & white, so Amvest (or someone) added some color to make things pop. Remember, video rentals were a big business at the time, and if you were going to put something on those shelves, you had to make it really jump out towards the prospective renters as much as possible. Plus, when you’ve got like 9000 VHS versions of the same movie competing against each other out there (we looked at one of ’em before! ), well, details such as that could very well make the difference between a rent/sale, or continued shelf-languishing. Okay, so upon first glance, it seems this is a competent but rather unremarkable VHS release of Night of the Living Dead from the 1980s. Not a bad way to spend an old-school Halloween night, granted, but where does the magic come in? Why all that hype during my intro? Well, I presume you read the title of this post, didn’t you? Yes, this tape was part of the Amvest “Grampa Presents” VHS series, and thus features Al “Grampa” Lewis hosting what is quite possibly the greatest horror film of all-time. Cool winnins! If this don’t don’t get yo’ Halloween spirits fired right up, well then I just don’t know. For those of you paying attention (all two of you), this series of tapes is one of my favorite subjects on this blog. Indeed, this will be the fourth (and, I hope, ultimate) article detailing them. As we saw a few weeks ago, these Grampa Presents tapes usually had Lewis’ visage and other appropriate hoopla plastered on them, but that didn’t necessarily mean he’d be on the tape. Well, as we’re about to see, it works the other way too, bucko. This post today is the ultimate culmination (blog-wise) of what began last Halloween. As you’ll recall (maybe), last October 31st is when I first looked at one of these tapes. I had long been intrigued by them, and I made a concerted effort to not only finally add one to my collection, but also to review it for that Halloween day. 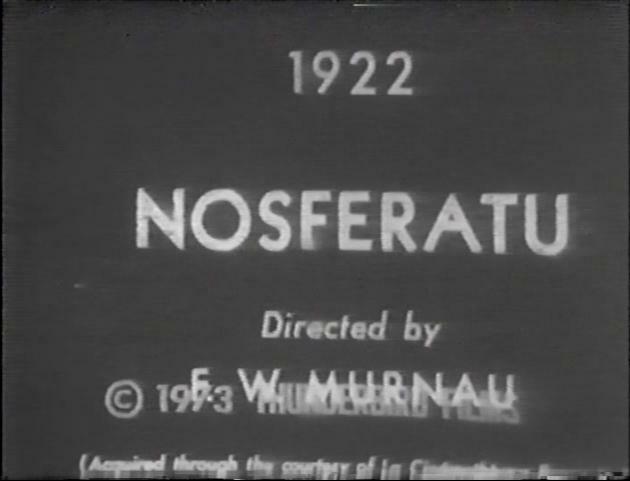 As I’ve semi-jokingly grumbled about time and time again, these Grampa Presents videos were strictly budget affairs (VHS releases that, back then, you’d typically find for around $10 – or less), and that first tape, a copy of 1939’s The Human Monster, demonstrated this aptly; it was duplicated in the LP recording speed, but on a tape with only enough to fit something in the EP speed. In other words, the tape ended before the movie did. After that wacky little mishap, rather than turn me off the whole thing, I was only further intrigued by the series. Not only because I was begrudged a whole movie/show/whatever the first time around, but also because no one was/is quite sure just how many installments were actually released. 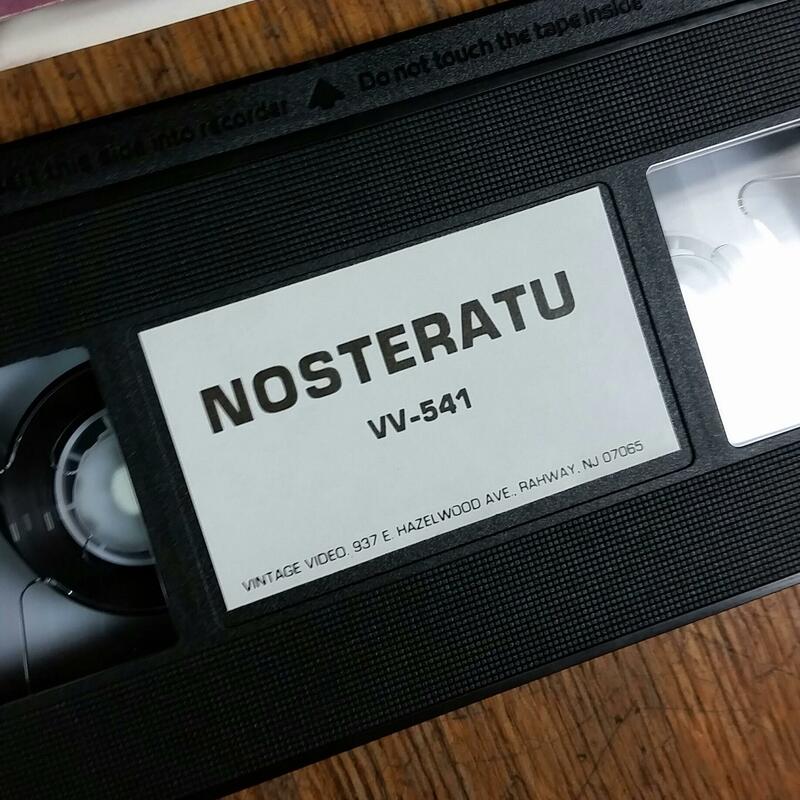 I’m going to explain further in a bit, but rest assured, until I got this tape, Night of the Living Dead was one of the ones I wasn’t convinced existed. At least not with Grampa on the premises. So anyway, that Halloween post last year gave way to my New Years post this year. There, with a (complete!) copy of Grampa’s The Corpse Vanishes added to my collection, I posted what I wanted to write the first time around; an insanely in-depth review of not only the tape itself, but also a look at this Grampa Presents series as a whole. While I wanted all that to be the final word on the subject, I’ve learned more since then, and frankly, Grampa hosting Night of the Living Dead is so unabashedly awesome, methinks I’m allowed to tread over some of the same ground again. And even if I’m not, I’m gonna; it’s my blog and I’ll do what I want. If you read any of my three previous Grampa Presents posts, you’ll notice that the sleeves feature, you know, Grampa. This series started in 1988, and his caricature and quirky lil’ rating system were supposed to adorn each of the respective tapes, though they were inexplicably left off some. But, that’s not when Amvest/Vintage Video/VideoFidelity/whoever (there’s a lineage of divisions/names, but for the sake of ease, it’s all Amvest to me, okay?) 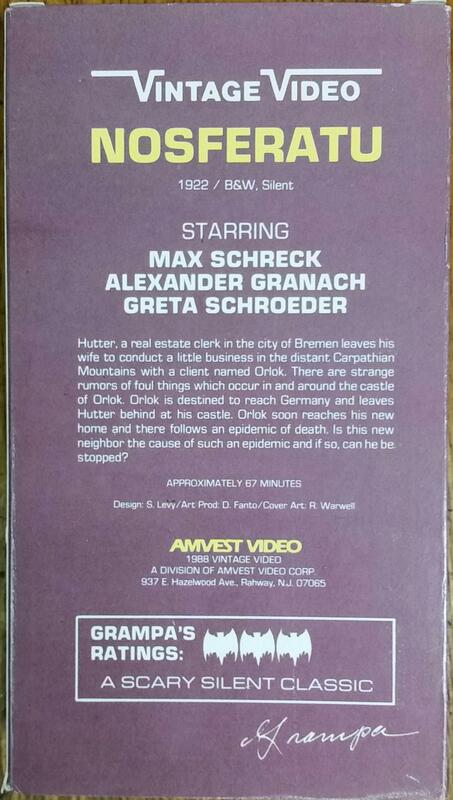 first started releasing movies on VHS; that goes back to *at least* 1985, as you can see in the copyright info above. Their output featured a wide range of genres, and when the Grampa series started in ’88, they just took the appropriate horror/sci-fi titles already released, kept the same catalog numbers, and later ostensibly re-released them as part of the Grampa line. I say “ostensibly” because prior to finding this tape, I was dubious that any of those earlier titles had actually been later “Grampa-ized” in any way, and I had obtained several ‘plain’ titles that bore that out. I’ll explain further later. For now, this tape, it has the appearance of one of those ‘plain’ 1985 Amvest tapes. Unlike the decidedly budget-looking qualities of the ’88 releases, these ’85 tapes were, outwardly at least, similar to the Goodtimes and Congress Video products of the era. Even the font and general layout is similar. When I purchased this tape, I naturally had my hopes, but from all outside appearances, I figured this was going to be a ‘regular’ Amvest release. Which, hey, if my previously-held theory that this was one of the titles that never had Grampa grafted on held true, this was at least as close as I could get. The catalog number was matched if nothing else, and besides, none of these Amvest tapes, Grampa or otherwise, are easily found. This particular release of Night of the Living Dead proved to be exceedingly rare; indeed, the first copy I saw for sale is the very one we’re looking at this Halloween day! So, I get the tape, I have to rewind it, I start it at the beginning, and duly proceed to flip my beans. The second the familiar (to me) Grampa intro appeared, I was pretty much already proclaiming this to be the all-time crowning achievement of home entertainment. Look, y’all can watch your mega-deluxe remastered Blu-ray copies of Night of the Living Dead all you want, the fact remains that they (probably) don’t open with a bat being “zapped” by lightning and transforming into Al Lewis, who then continues to flap his arms around appropriately, and all in front of a green-screen (blue-screen?) with generically spooky music in the background. Therefore, this release is clearly the superior choice…if you can find it, that is. Al Lewis’ famous Grandpa Munster character was going through a resurgence of sorts in the late-1980s and early-1990s. ‘Course, he didn’t go by that moniker, it being copyrighted and all. 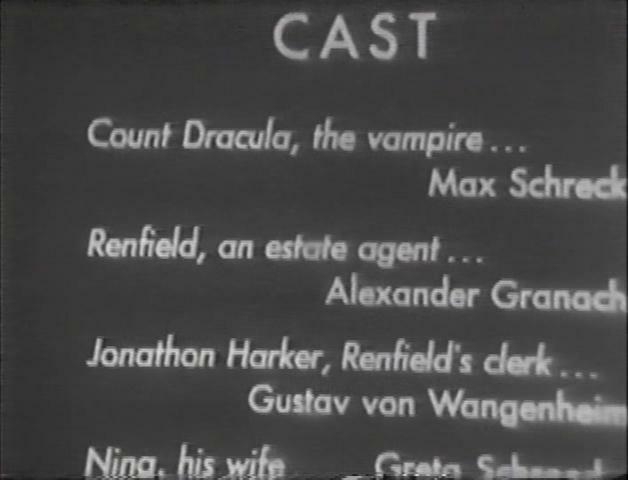 Thus, the “Grandpa Munster” name gave way to a simple “Grampa,” which was how he was often billed in his post-Munsters endeavors. Everyone knew who he was supposed to be, anyway. Among his many ventures during the time-period: Starring in a (thematically) similar horror host-showcase for TBS, 1987-1989’s Super Scary Saturday. Also, having his own Atari 7800 game, 1990’s Midnight Mutants; even when ignoring my fondness for Lewis, it’s my pick for best game on the system (and along with Double Dragon, easily my favorite). Heck, dude even had his own NYC restaurant for a few years. Fun fact: I’ve got a matchbook and a take-out menu from said restaurant in my collection. They make me feel like a big man. So, these Amvest tapes were just another part of that career resurgence. Even though they seem to have gotten a promotional push by Amvest at some point (well, promotional buttons were made up, anyway; I’ve seen one, they exist), the overall distribution was so limited that they’ve wound up fairly unknown in this day and age. As I’ve stated in my other articles on the subject, these videos range from “highly obscure” to “impossibly rare” (and I’d say this entry definitely falls towards the rarer side of that scale), though truth be told, regardless of rarity they all seem to average around $20 to $30 used. Sometimes even less. Look, these Grampa Presents tapes are worth more than, say, that old VHS copy of Jurassic Park floating around your basement, but in the grand scheme of things, they’re not that valuable. These weren’t the first tapes to introduce direct-to-video horror hosting; Elvira’s Thriller series was (near as I can tell) the one to kick it all off, back in 1985. (Remember when we looked at Elvira’s VHS hosting of The Cyclops?) Those Thriller tapes were pretty major releases; big, eye-catching boxes, high quality SP recordings, and Elvira at (or very near) the peak of her popularity. In some ways, this Amvest series feels like the budget answer to those Thriller videos, though they probably weren’t intended to be. Or maybe they were, I don’t know. There were (supposedly) a whopping 59 individual Grampa titles in this series; I’ll give you the whole list in a bit. For those that may want to check out some of these but aren’t weird enough to go after ’em all (like I am), I’ll tell you right now: Grampa’s intros and outros (there are no during-the-movie segments) for each title are exactly the same. What, you thought Lewis was gonna film 59 unique intros and outros? Nope! So, if you’re going for one, you can make your choice based solely on what movie you’re fondest of. ‘Course, that depends on if it was a title actually released with the Grampa segments, and whether it’s even remotely possible to find, and so on and so forth. Lewis’ Super Scary Saturday on TBS is probably the first thing that comes to mind for those that haven’t seen one of these tapes but are imagining a horror hosted showcase starring Grampa. If you pick up one of these Amvest tapes, don’t go in expecting anything close to that show; Amvest was strictly a budget outfit, and boy, it shows. Forget the relatively big-budget, expansive set of the TBS show; Lewis does his entire shtick in front of a green (I guess) screen, with images of a castle (from White Zombie, I believe) and a lab (complete with squiggly neon accents; hey, it was the 1980s) flashed behind him at appropriate moments. Lewis had his Grampa shtick down to a science by that point, which was fortunate, because he was basically on his own here. Not only does he have to introduce the proceedings and explain this Amvest video series, but he also has to be entertaining. To that end, he cracks jokes about people confusing him with Paul Newman, states this is all taking place in “Downtown Transylvania,” and posits that he’s 316 years old. And that’s all in addition to yelling at the aforementioned, off-screen Igor. Igor is also unheard, though the voiceover that was supposed to be added (but usually wasn’t) was intended to be him. These intros and outros add up to under 8 minutes total, but they absolutely give the tape(s) genuine personality. And, Grampa’s promise of “we’re gonna watch it together!” in regards to the movie, obviously it’s just meaningless hype, but it does do a lot for the atmosphere. There’s almost a personal connection here, which was (is?) in the best tradition of television horror hosts. It’s one thing to dryly introduce a film, but it’s another thing to establish a rapport with the audience. Lewis easily manages that. And not just because he was currently hosting movies on TBS when this was made, but also because he was just that good at what he did in general. Night of the Living Dead is an intense film, a great film, a genuinely scary film. It’s not exactly a fun film, though. Not in a comical sense, I mean. So, the jokey Grampa segments that bookend it may sound like they’re at odds with the rest of the tape. But, those contrasting styles are part of what makes this so appropriate for today. Halloween is about the scares and whatnot, sure, but it’s also about havin’ some fun. And, those differing styles are another throwback to honest-to-goodness television horror hosting. The host was there to provide a little levity along with the horrific proceedings. So here, it all just clicks. In a cheap, old, budget VHS sort of way, naturally, but obviously that’s right up my alley. Your mileage may vary, of course. As evidenced by the screenshots, Amvest did not have access to the highest quality print of Night of the Living Dead in existence. Nope, this is a rough one. It’s pretty blasted, scratchy, dirty, what have you. You can even see the edge of the frame (?) at the top of the screen throughout, as evidenced above. Lotsa crackles on the soundtrack as well. 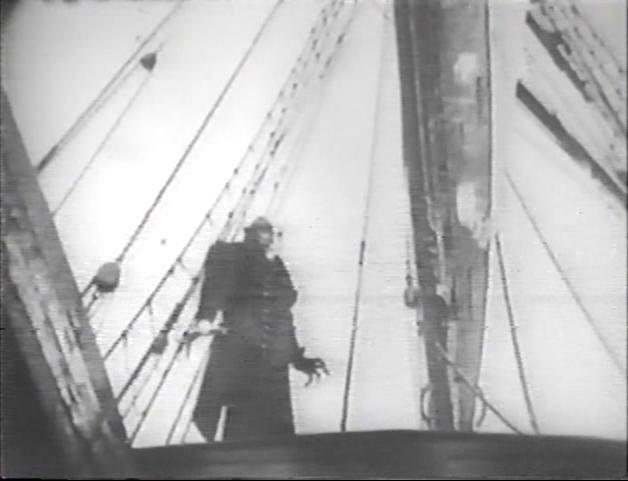 Obviously, this copy of the film made countless trips through the projector before it wound up in Amvest’s hands. But you know what? None of that really bothers me. 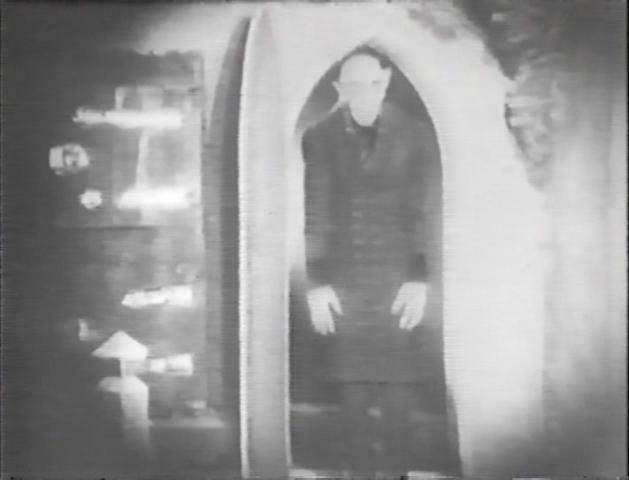 I mentioned this in the previous Nosferatu post, but films of this nature, they can sometimes benefit from grainy, worn print quality. Only to a point, granted, but sometimes accumulated wear to a print can enhance the feel of a movie. I didn’t say that, you incredible tool. Obviously it’s preferable that a film look as pristine as possible, especially when it’s a movie as important as Night of the Living Dead. THAT SAID, the unflinching storyline, the grainy film stock, the claustrophobic atmosphere, the immersive camera-angles, the gradually-ramping intensity, it’s all somehow made even more otherworldly, even dreamlike, by the quality of the print on this tape. It almost feels more nightmarish, like you’re peaking in on something better left unseen. So, the condition of this print of Night of the Living Dead, plus some less-than-stellar duplication and the EP recording speed, by all means none of it should work in the favor of this viewing experience. And yet, somehow, it does. Criterion won’t come a-callin’ for a copy of this version anytime soon, but for our purposes here today, it’s perfect. A zombie shuffling through a graveyard, in black & white, via a cool tilty camera-angle? Looks Halloween appropriate to me! I have strong Halloween-connections to Night of the Living Dead. Yeah yeah, real unique, I know. Like so many others I’m sure, that’s when I first discovered the film. Well, technically it was November 1, 1997. 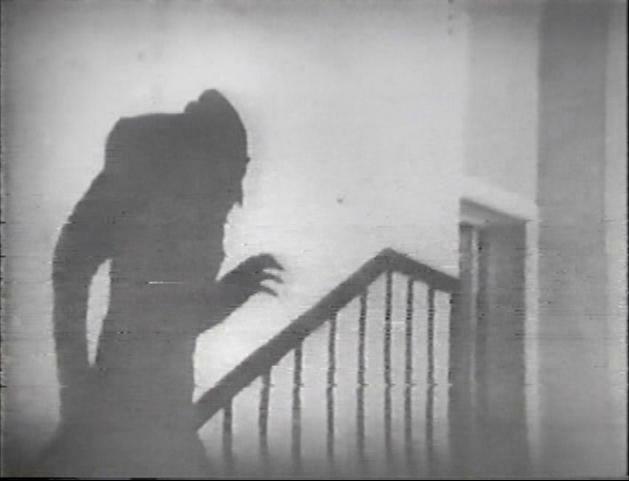 I’ve talked about this before, but it was through The Son of Ghoul Show that I first saw the movie. 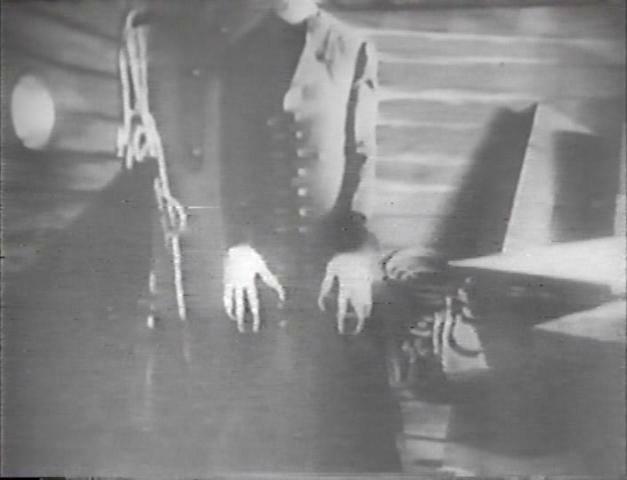 At the time, Son of Ghoul was running on both Fridays and Saturdays, same episode both nights, from 8 to 10 PM. That weekend, October 31st fell on a Friday, but it was some channel surfing on the following night that introduced me to both The Son of Ghoul Show and Night of the Living Dead. I became a fan of both immediately. Night of the Living Dead gripped me in a way no other film did, at least not up to that point. Even with the customary humorous sound effects Son of Ghoul added to it (this being my first episode, it took me a moment to realize what he was doing, but I loved that aspect, too), I was completely and utterly riveted. I just had never seen anything like it. Since Halloween fell on a Friday that year, Son of Ghoul naturally had things covered. But obviously, it didn’t always work out that way. Luckily, when it didn’t, that same station (WAOH TV-29/WAX TV-35) customarily ran the film itself (as opposed to syndicating America One Network content, as they usually did) on October 31st. This was an entirely different print from what Son of Ghoul had, and truth be told, it exhibited a lot of the scratchy, worn aspects that I feel can and do add an extra nightmarish element to the film. In fact, it’s from those annual airings that I first realized this! For the sake of comparison, I once wrote about one of those broadcasts here. I consider Night of the Living Dead the capper to my generally-preferred era of classic horror & sci-fi films. Actually, it comes a bit later, to be honest. I usually go for the Universal classics of the 1930s and 1940s, the poverty row films from the same period, and the cornball stuff from the 1950s and early-1960s. After that, my interests wane considerably. I wasn’t always quite so narrow-minded; I wound up like this through years of watching, re-watching, taste refinement, what have you. Hey, I gotta be me. Night of the Living Dead, however, transcends my admittedly self-imposed limitations. Besides my nostalgic history with the film, I just find it an absolute masterpiece from start to finish. Everything about it works, and works perfectly. The acting, the plot, the claustrophobic intensity, the subtle (or maybe not so subtle) social commentary, the camera-angles, it’s all simply fantastic. The low budget that would have hampered almost any other film instead gives this one a gritty realism. There’s a real substance behind Night of the Living Dead; it’s not just a bunch of zombies eating people in order to give the audience a gory body count and little else. I detest that kind of film making, which is why I respect director George A. Romero so much; there was always more to his work, and this movie is a prime example of that. Do I really even need to explain the plot of Night of the Living Dead? Just about everyone has seen it; with the public domain status, there were (are) numerous home video releases, television airings, even free and legal online downloads. You almost have to be trying to not see this movie! Look, I have a hard time believing anyone stumbling upon this article hasn’t seen the original Night of the Living Dead, but if by some strange occurrence you haven’t, you can watch it here, or at least read more about it here. Like I said a bit ago, Night of the Living Dead isn’t just a “zombies eatin’ guys, yo” movie. There’s more to it than that, including some pretty terrific social commentary lurking beneath the surface, with much of the film being an allegory for the Vietnam War. I’m far, far from the first to point out there are moments where Night of the Living Dead resembles gritty newsreel footage, and while the connection may be easy for some modern viewers to overlook, at the time of release it had to be hard for viewers of a certain age to miss. But probably the most visible influential element, beyond the plot and what it did for the horror genre, is the star: Duane Jones. Jones plays Ben, the hero of the film. Of all the characters, Ben is the most level-headed, resourceful, and calm (to a point). Ben also happens to be black. To have an African-American in the lead role of a horror film, as the sanest voice of reason, in 1968, that was a huge deal. It was a monumental leap from Mantan Moreland in King of the Zombies, that’s for sure! And what’s more, while there appears to be some underlying racial tension, his color is never referenced in the movie; he’s simply another person trying to survive the onslaught of the undead. I like that. There were technically zombie films before Night of the Living Dead, (the aforementioned King of the Zombies comes to mind, as does 1932’s White Zombie), but the zombie genre as we know it today basically begins here. Earlier films regarding the subject were more along the lines of people in a trance, products of voodoo, those kind of zombies. The idea of the shambling, mindless, flesh-eating zombie – an idea that found life in a thousand Italian rip-offs (which I hate), the Resident Evil video game series (which I mostly love), today’s The Walking Dead, and of course the sequels to this Night of the Living Dead – it all started here. There’s been some differences over the years: the zombies in Night are scared of fire, whereas those in The Walking Dead are drawn to (or so I’m told; I’m not a Walking Dead fan), but the basic concept has remained the same. You still gotta kill the brain, man! Part of what makes the film so effective is that we don’t know why the dead are rising and going after our flesh. As I mentioned before, there’s a radiation explanation, in which a satellite returning from Venus was detonated in our atmosphere, but it’s more of a theory than a definitive conclusion. Above: Johnny’s coming to get you, Barbra! Upon this latest viewing, I was struck yet again by just how perfectly-paced this film is. The ramping intensity is something to behold. It starts out foreboding but calm enough, and then grows increasingly nerve-wracking, until the natural boiling point is hit and it all goes careening out of control. You can almost feel this living dead situation grow from something relatively small and not very well understood into a legitimate, widespread crisis. That the movie is so convincingly able to put this forth when, for the most part, it’s only seen from the viewpoint of those trapped in the farmhouse, it’s a testament to just how well-made it is. And furthermore, because there’s such a wide-range of dispositions on display via the different people inside, it’s almost like a gauge of how the world at large is dealing with the onslaught. From the relatively calm and resourceful to the angry knee-jerk to the indecisive, and even to the victims of the plague, a large slice of human nature is on display – and over the course of the film, some of those lines are occasionally blurred. It speaks to the different personalities of not only the main characters, or even the fictional world beyond the farmhouse, but to us, the very real individuals watching the film! I’d guess most of us would like to identify with Ben, but in a situation like this, who knows who we would actually resemble? And, in a broader study of life, guess what? It doesn’t matter who or what they (or we) are or what happens; different roads are taken, but it all has the same eventual outcome. Man this movie is brilliant. Night of the Living Dead is the first in Romero’s Dead film series. While the social commentary, and number of zombies, increased in following entries, this original film is the only one I concern myself with nowadays. I didn’t like the way things were heading in 1985’s Day of the Dead, and after reading accounts of the following entries, well, I really had no desire to see any of them. Even 1978’s Dawn of the Dead, the first sequel to Night, while there was a point when I considered it my favorite of the series, as I grew older I gravitated back to this original. I know that’s probably anathema to admit, and yes, Dawn is technically a better film, with stronger social commentary, a higher budget, etc. BUT, Night, I just find it so much more effective. I like the comparatively subtle social commentary, but more importantly, the claustrophobic black & white nature of the film, it still grips me in a way no other horror movie can. 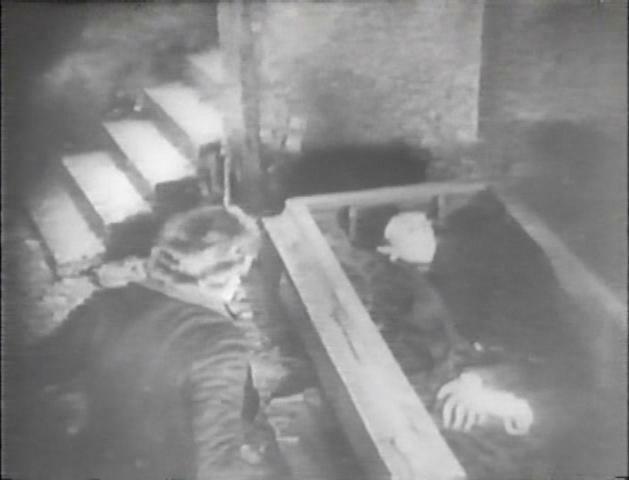 And as far as the Dead series as a whole goes, Night seems the purest; no trained, and from how I understand it, eventually intelligent, zombies – a germ of an idea that really turned me off Day upon my first viewing so many years ago. Nope, the creatures in Night are just relentlessly after your flesh; that’s it! Do you really need more of a driving factor than the prospect of your skin bein’ munched on?! I guess what I’m getting at is that I prefer to view Night of the Living Dead as a standalone film and not as part of a wider series. I know many will disagree with me, and that’s fine; it’s strictly a personal choice on my part, and I’m well aware that I’m probably in the minority. Chilly Billy! Yep, there’s an added element of horror hosting history on display in Night of the Living Dead: Bill Cardille, popularly known as “Chilly Billy,” hosted Chiller Theatre in Pittsburgh (where this film was, uh, filmed) for years. Here, he plays a news reporter, keeping viewers abreast of the crisis in the world at large. Cardille passed away in July, and while I myself never had much experience with him beyond this movie, it’s clear that he meant a lot to his local viewers. So, here’s my small, belated tribute to one of the icons of horror hosting. R.I.P., Chilly Billy. If there’s one way to live on, being in Night of the Living Dead, of all films, is it! And that brings us back to Grampa, the element that takes this VHS tape of Night of the Living Dead from “great movie, interesting release” to “I love this I love this I love this so so so muchhhhh.” The movie is pretty untouchable no matter how you see it, but when it has horror hosted bookends, it’s all just so much more fun. Especially when they’re courtesy of Al Lewis. Because the segments for this series were all the same, with only the voiceover in the intro supposed to have been changing, much of what Grampa says isn’t tied to any particular film (for obvious reasons), and what is movie-related is just generic oohing and ahhing. For example, the first thing he says upon returning from the movie is “That was so scary, it scared the blood right back into my veins! What a feeling!” Not an unusual thing to say given the circumstances, and in the case of Night of the Living Dead, it works. Thing is, a good deal of the (prospective) movies in this series, they were more silly or cheesy than they were scary, which makes the line either pretty appropriate or wildly ironic, depending on the film. No one is quite sure how many titles were actually released as part of this Grampa Presents line. We have a list of titles that were supposedly available, via a scrolling list in the outro segment (above), but only a portion of those have been confirmed to actually exist. It doesn’t help that ones known to exist with the Grampa-branded cover don’t necessarily have Grampa on the tape, and ones that have ‘normal’ covers can sometimes have the surprise host segments. And, as we’ve seen today, there were re-releases of older, 1985 Amvest tapes that left the covers the same, but updated the tape itself to fit the series. And they ALL share the same catalog numbers, which just makes things more confusing. It’s an interesting, though often maddening, mish-mash of releases, and every time I think I’ve got a handle on things, something comes along that makes me question everything all over again. Before I got this tape, I had basically come to the conclusion that the older ’85 titles were added to pad out the number of supposed Grampa Presents entries during the outro scroll, but I held doubts that they were ever updated to correspond to the 1988 series beyond that. I had obtained enough of the ’85 titles to where I thought I was safe in making that educated (ha!) guess. Needless to say, my finding of this Night of the Living Dead shatters that theory and leaves things pretty much wide open now. So, my new rule of thumb is “If it’s on this list, and it’s available, give it a shot, because you never know until you play it.” That’s the best and only conclusion I can come to. I strongly suspect Amvest released all of these movies on VHS at some point, and for all I know, there’s corresponding Grampa versions for each and every one. In addition to those 59 titles, there were also four special compilations hosted by Grampa: Two movie trailer collections, and two horror-themed cartoon collections. These four listings were not included in the scroll at the end of these Grampa Presents tapes, and technically probably aren’t officially considered part of the series. Still, they’re Amvest, and they’re Grampa, so for the sake of completion, I’m including them here. It should be noted that the two movie trailer tapes are probably the easiest Amvest Grampa tapes to find. It seems used copies are almost always readily available on eBay and Amazon, especially the Grampa’s Monster Movies compilation. It’s important to note that in 2004, Passport Video (who somehow share a connection to the Amvest of old) released DVDs of the horror trailers and cartoon sets. I don’t own either (yet), but from how I understand it, they were straight conversions of the old Amvest tapes, barring maybe one or two alterations. The VCR From Heck has more info on these DVDs. It’s wild to think that Lewis was still alive when those DVDs were released; hopefully he got a few extra bucks thanks to them. It’s a trip listening to Lewis as the list scrolls. Mostly, he makes generic comments such as “I remember that one!” until he decides it’s time to yell at Igor some more for his apparently bad eating habits. It’s doesn’t make much sense, but it’s better than a dry, silent scroll if nothing else. The end of the scroll promises “more to come.” This list of 59 titles is the only real resource we have of the Grampa Presents releases, and as previously stated, whether all of those were even put out with Lewis-involvement of some sort is in question. Still, that statement of “more to come” is thought-provoking. Is it possible that Amvest later released some additional titles with Lewis’ host segments grafted on? As we’ve seen, they wouldn’t have even necessarily included the appropriate hoopla on the VHS sleeve; you never know for sure until the tape is played. After the scroll, information is given to order direct from Amvest if a desired title couldn’t be found in stores. And, my guess is, a good many couldn’t. $12.95 total may sound like a lot for a VHS tape now, but back in 1988, that was most definitely a budget price. Remember, official, big-time movie releases on the format then were over $20 (sometimes way over). But $13? That’s totally doable. And, I wouldn’t be surprised to learn that actual in-store copies were even cheaper, especially when establishments were trying to clear out the old stock to make room for the new. Honestly, I can see these running $5-$10 easily in those instances. Now granted, the quality of the tapes often left a lot to be desired, but hey, that’s where the old adage “you get what you pay for” came in. Anyway, on the off chance you did come across these tapes at a brick-and-mortar video store, you were supposed to look for the “Casket of Horrors” display, which housed all of them in once concise section for your perusal. I have no idea how many of, or even if, these displays were produced; the tapes themselves seemed to have barely gotten around, after all. But, there’s no doubt that the display is painfully, ridiculously, undeniably cool. Do you have any idea how badly I’d flip if I could get one of these stand-ups for my collection? Pretty badly! We’re talking an “only technically an adult” level of excitement here. I’m trying to decipher what tapes are on display in this scene. Given the less-than-pristine quality of this tape, it’s not an easy task. Third from the left I’m almost positive is a copy of this Night of the Living Dead, and second from the right I’m pretty sure is Godzilla Vs. Megalon. The rest, I have no idea. Despite Grampa’s assurances each tape would feature his face on the cover, these all appear to be 1985 releases, and who knows if they were all actually altered to feature Grampa on the actual video; Night obviously did (at some point), but my Amvest Megalon? Despite showing some signs of potentially being an ’88 reissue, it was not Grampa-ized (much to my understandable chagrin). So again, there’s just no way to tell without having a tape in-hand and playing it. If one did decide to order direct from Amvest, Grampa gives the standard address, New Jersey residents (where Amvest was based) had to add 6% sales tax, and so on and so on. But, he also states that when ordering, please allow 4 to 6 weeks for delivery “because in your neighborhood, the bats don’t fly that fast!” Yes, Grampa suggests your tape would be delivered by a bat. How can you not love the guy when he does things like that? Grampa’s final pitch before the sensory assault that was (is) this tape finishes? “So listen to Grampa and don’t dig your own grave! Go out and buy Amvest Video!” That’s pretty fantastic. And what if you don’t buy Amvest? Grampa proceeds to vaguely threaten what will happen if you don’t: “One night, it’s dark. You’re alone? You won’t be; I’ll be there visiting!” This statement is then followed by the classic, loud Grampa laugh that continues as the screen fades out. Again, how can you not love the guy when he does things like that? One last touch: the Amvest copyright card punctuates the video, complete with an evocative score (plus some continuing Grampa laughter!) and computerized blood dripping down the screen. If somehow someone hadn’t realized they were watching something sufficiently “spooky” prior (yeah, sure, uh huh), this last image leaves no further room for doubt. This, this tape, I just don’t think I can accurately describe how cool it is. Some may see it as a cheap, wildly obsolete relic from a bygone era in home video. Not me. I see it as an incredibly entertaining product from the earlier years of video. Yes, the quality isn’t the greatest; it’s a budget release after all. But the Al Lewis segments are fun, especially to a fan such as myself. And the movie? You just can’t touch the original Night of the Living Dead. Even when it wasn’t an ‘authoritative’ presentation, it works, because the film is just THAT good. And, despite the somewhat lacking print quality here, like I said before, it adds an extra layer of nightmarish, grindhouse feeling to the proceedings. Back when I reviewed The Corpse Vanishes as presented via this series, I held doubts that I’d ever do such an in-depth study of one of these titles again. Obviously I didn’t hold true to that. But, I think I was justified in revisiting. You just can’t top this one. My hunt for more of these titles will continue, I’ve gone too far to stop now, but in the way of sheer Halloween coolness, this Night of the Living Dead entry won’t be topped. The game is over, and I have won. Previously, Grampa Presents The Corpse Vanishes was my de facto favorite entry in this series. But now, I’ve got to amend that standpoint a bit: It’s now safely tied with this one. The Corpse Vanishes is still my favorite “traditional” release; cheaper packaging, the Grampa advertising all over it, etc. Nevertheless, this Night instantly shot right up there next to it. (EDIT: Well, as of 6/28/17, it’s a four-way ‘favorites’ tie; I had since discovered Grampa’s version of The Devil Bat, and now, The Ape Man, too! Instant VHS royalty, both of them!) No, Al Lewis isn’t on the sleeve, but he’s present where it really counts, and that’s more than enough to rank this tape up there not only with my favorites in the line, but also up there with the favorites of my not-inconsiderable VHS collection as a whole. That’s a big statement coming from me, but I have zero problem making it. And with that, our big Halloween post comes to a close. I can’t think of a better choice for the blog today. 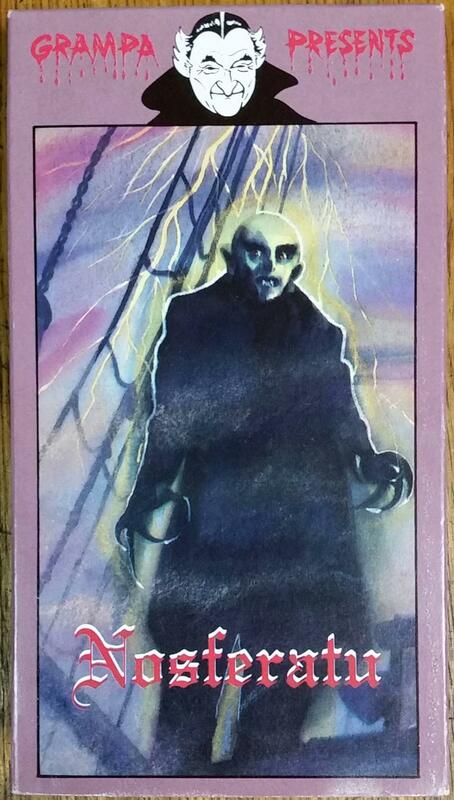 Sure, in the realm of these Grampa tapes, there are other appropriate choices, too; Carnival of Souls would have sufficed nicely, had I decided to give it the spotlight. But, given my fondness for this series, my history with Night of the Living Dead, and the fact this particular release is painfully rare, this was the logical, and to me, only, topic I could see myself going with. It’s just so Halloween appropriate! I simply couldn’t have asked for better material to cover on the blog than this. Have a great Halloween everybody! This entry was posted in Uncategorized and tagged 1968, 1985, 1988, al lewis, al lewis presents, al lewis vhs, amvest, amvest grampa, amvest vhs, amvest video, budget, budget tape, budget vhs, cinema, elvira, film, film review, grampa al lewis, grampa munster, grampa presents, grampa presents amvest, grampa presents vhs, grandpa al lewis, grandpa munster, halloween, halloween movie, halloween night, halloween tape, halloween vhs, horror, horror host, horror host movie, horror host vhs, horror hosted, horror hosted movie, horror hosting, horror vhs, movie, movie review, Night Of The Living Dead, night of the living dead 1968, night of the living dead horror host, night of the living dead tape, night of the living dead vhs, old, original night of the living dead, overview, public domain, release, review, sci-fi, science fiction, super scary saturday, tape review, tbs, tbs super scary saturday, the munsters, theater, vhs, vhs series, vhs tape, video, video review, video series, video tape, videotape, vintage, vintage vhs, vintage video on October 31, 2016 by neovideohunter.